You will learn through a practical hands-on approach, choosing your own dishes to prepare. The results will impress your friends back home with such culinary wonders as green Thai curry, fragrant soups, stir fry chicken with cashew nuts, and many other delicious and exotic dishes. 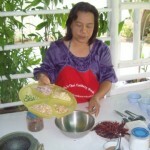 One of the most distinctive aspects of Thai cooking is its use of herbs and spices. Some Thai dishes are very spicy, but by no means all of them. Thailand has a long history, going back to ancient times, of the use of herbs for medical purpose, and this in turn has permeated the ways of cooking and preparing food. Sharing a meal is an important part of the day for any Thai person, and meals are seldom taken alone. That is why all the dishes are generally served at once during Thai meal, and why there is a communal spoon placed alongside each dish for people to help themselves and to serve others. Thailand is blessed with many varieties of plants, herbs and spices which ensures a balanced diet. Today, visitors can both relish classic Thai menus and study the art of Thai cooking. Krabi Seafood Lunch at Ku La Kasai Restaurant. Comments Off on Krabi Seafood Lunch at Ku La Kasai Restaurant. Thai Seafood Lunch at Ku La Kasai Restaurant. Happy New Year 2010 again! Last year was a good “kickstart” year for PlacesAndFoods.com. Not to mention good internet connection from Streamyx lately. I was told lately that I blogged too much of invited food reviews. Paid food are fake reviews. Well, that is so not true. 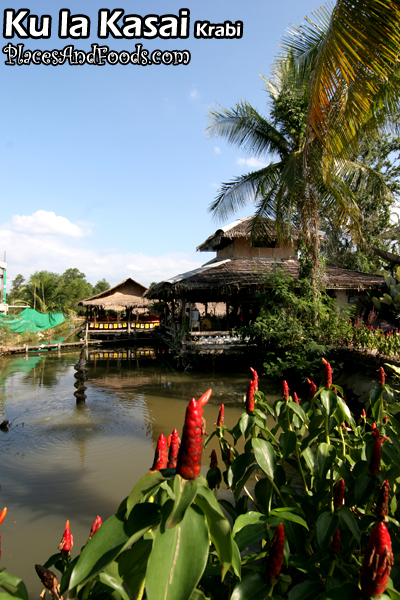 Let me introduce a Thai farm restaurant from my recent trip to Krabi. Well, this was not a paid food review. Krabi Food, Culture and Pride. Comments Off on Krabi Food, Culture and Pride. Food is another fundamental part of the tourist experience. 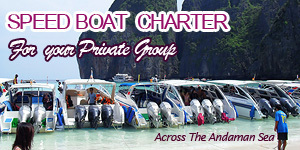 Krabi is well known for its amazing landscapes, beaches and islands. 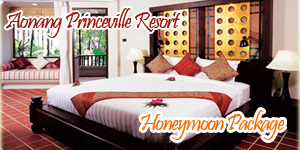 Blessed with attractions and interests well contained in close proximity and within easy reach for tourist to discover. Energetic packed with all kind of daily recreational activities to participate and enjoys the scenery with their loved ones. Apart from the daily recreational activities, one should not miss to discover and experience the local culinary attractions. Local bites and tastes acts as a vital link to our unique culture and heritage. Different dishes and cooking plays an important part of everyday life. Whether it is a pancake served by the street vendor or a signature dish by a local restaurant brings upon a moment to enrich tourist experiences. Known as “Hoi Chak Teen” in Thai or as a type of wing-shell that belongs to the Strombus Canxarium family. It looks like a conch but is smaller and brown in color. Its special characteristic is its dark brown walking legs which are referred to as “feet” or “teen” (in informal Thai). It is also known to the Indonesian in Riau Archipelagos as ” Gong Gong.” This local seashell is recognize as a seafood delicacy in Krabi. It is commonly found at the river mouth near sandy banks such as areas around Koh Jum and Koh Siboya. Harvesting is only done by the local fishermen twice a month during the receding spring tide. To prepare the dish, the wing shell is soaked in salty water for about half an hour. A few crushed chilies are added to the water to make it spicy. The wing shell then begins to move, pushing its feet out and expelling the mud from inside. It is rinsed several times and then put in to a pot of cold water. The pot is then put on the stove to boil and when the water gets warm, the wing shell pushes its feet out. As soon as it is cooked, it is ready to be served. To eat the morsel, you pull the feet and the mollusk will come out. You can also use a toothpick to reach into the shell and pull all the meat out of the shell in one go. It is eaten with a dip made of garlic, chilies, sugar, lime juice and fish sauce. The shells are also made into decorative items for the home or sold as souvenirs. Fruit Vendor In Front Of City Hotel, Krabi Town. 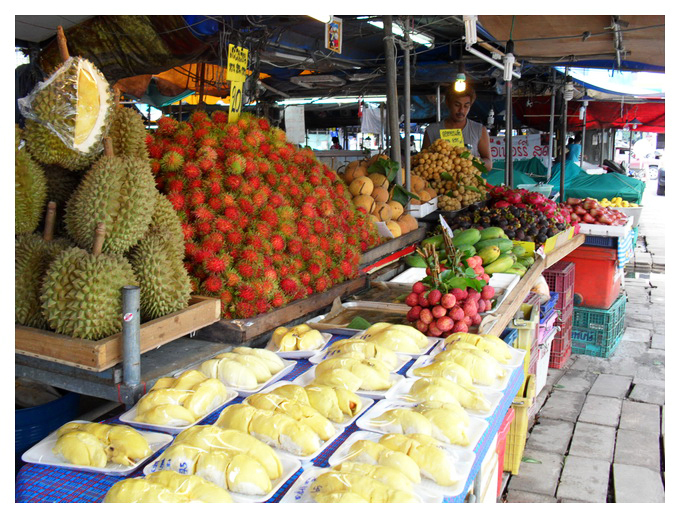 The hot, tropical climate and abundant rainfall of Thailand are perfect for growing a huge variety of fruits. Some Thai fruits are incredibly sweet and juicy, while the taste or texture of others might seem, at first, strange to foreign guests, but they will surely add a delightful extra dimension to the gastronomic experience which awaits every visitor to ” Amazing Thailand – Amazing Value “. Fresh fuits is popular with Thais as an anytime snack, or juice drink and is eaten as dessert at most meals. it may be served raw, freshly sliced in salad, cooked in many different ways, or prepared as ice creams. Thai fruits are rich in vitamins such as A, B-complex, C, D and due to their assorted minerals and essential elements, are ideally used in traditional rejuvenation and beauty featured in Thailand’s luxury spas. So much in our lives works in cycles. We retire things we’ve used for years and grown tired of, replace them with something new, and then come to miss the originals, which we recruit back into service, their attractions revived. This principle can be seen in the cycles of fashionability that revolve around clothing, furniture, styles of decoration, movie genres and much else. It even applies to household tools and kitchen utensils. These days Thai consumers of kitchen items place the emphasis on convenience and the appearance of modernity. Pots and frying pans are lined with Teflon to keep food from sticking, plastic electrical water heaters are preferred to stainless steel ones because they look more attractive and pepper grinders are made of clear plastic so that the level of the peppercorns inside can be seen. But the cook whose kitchen is equipped with a copper-coated frying pan with brass handles, expensive items that must be imported, will be seen as the most up-to-date of all. Copper and brass kitchen equipment is now seen in Thailand as especially desirable. If there is a fish that is close to the heart of Central Thailand’s culinary tradition it is probably the pla thu, a type of mackerel that goes ideally with nam phrik kapi, the iconic chilli dip sauce. But there are several varieties of pla thu, including types found off the China coast and in Indonesian waters. The one that Thais like best, and which inhabits the Gulf of Thailand, is not especially big and is notable for its oily meat and its appetising aroma and flavour. Its life cycle involves a certain amount of travel. The mother lays her eggs in southern Thai waters where there are rocky reefs to protect them. When they hatch, the tiny fry gradually make their way to the Gulf of Thailand, and the closer they get to the part of the gulf that they are seeking, with its muddy bottom, the more food they find. It abounds in the muddy-bottomed sea off of Samut Songkhram and Phetchaburi, where the fish grow to full size and their meat reaches maximum quality. It is in these places that the best and tastiest pla thu are caught. The fish that aren’t caught by fishermen return to the South to breed and the cycle is repeated. Since the entire life cycle takes place in Thai waters, this variety of pla thu is considered to be a Thai fish. It is one fish that is eaten by Thais in every part of the country. Greater galangal is an erect annual plant with aromatic, ginger-like rhizomes, and is commonly used in Thai cooking as a flavouring. The approximately 0.04% volatile oil content has therapeutic uses as carminative, stomachic, antirheumatic and antimicrobial agents. An essential ingredient in the preparation of the Thai version of red curry paste, Galangal is used in popular dishes such as the shrimp soup with lemon grass – Tom Yam Goong, chicken soup with coconut milk-Tom Kha Gai, stir-fried meat or vegetables in a dry red curry paste – Phad Prik Khing, a fish curry sauce – Khanom Jeen Nam Ya – and a Northern Thai curry called Hang Le.